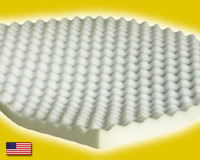 Our egg crate foam mattress topper is the perfect way to soften up a hard mattress. They can be set on top of a mattress either fingers facing up or down, your choice of comfort. Our egg crate foam mattress topper is built from much denser and higher quality foam than the cheap stuff sold at discount stores, plus it is thicker than most. We have the real deal! The egg crate foam mattress topper does not have elastic bands or some other scheme to keep it in place. Gravity and the fitted sheet does the job. Please remember to add another 2 1/2 inches to your fitted sheet depth to accommodate the egg crate topper. Our egg crate foam mattress topper, being sealed up tight, sometimes causes the scent of these products to concentrate to a disagreeable level. A few hours of airing usually removes the odor, several days is best. The Full XL Size Egg Crate Foam Mattress Topper 2" Thick is the perfect way to soften up that hard mattress and is built from dense, high quality foam.